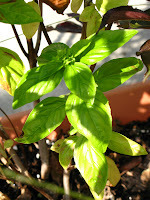 The Un-Official Blog of Romance Author Maddie James: Basil, Cabbage, and other Veggies...Oh My! The next Iron Cupcake Challenge secret ingredient? Cheese! 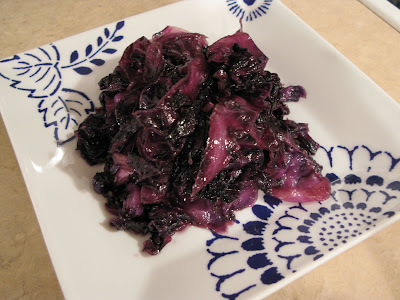 Remember a few blogs ago when I mentioned I met a woman on the plane to Rapid City who told me about her grandmother's red cabbage recipe? Well, I tried it out tonight. Here is what I did. 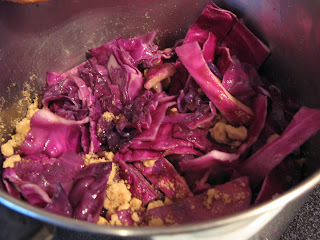 I tossed it all in a pan and braised on med-high to high heat for oh...until it looked done. What's done? The lady said it should be "almost caramelized" so that was what I was shooting for. And for some odd reason near the beginning of the cooking process I thought, "I don't have enough butter" so I added some more. No. Don't do that. I ended up ladling a lot of extra butter off. So, I just kept cooking it down. And more. Watching to make sure it didn't burn with all that sugar. Until...yes...almost caramelized! And then dished out on the plate it looked like this. I brought the last 5 green peppers in tonight from my backyard garden. Yay! I'll put them to good use in a day or so. Sad, kinda, that they are the last of my measly produce. Maybe more next year. Don't for get the October 1 discount code for buying ebooks at Resplendence Publishing!